Wij identificeren genen die de ontwikkeling van lever- en pancreascellen controleren in embryos, en die de celidentiteit handhaven in volwassenen. Wij bepalen dan hoe ziektes worden veroorzaakt door dysfunctie van die genen, en hoe ziektes kunnen behandeld worden door herstelling van de cel- en genfunctie. De structuur en functie van onze cellen verschillen van één orgaan naar het ander, en het proces waarbij de cellen orgaan-specifieke eigenschappen aanwerven wordt "celdifferentiatie" genoemd. Het laboratorium onderzoekt transgene muizen en humane stalen et heeft daarmee genen ontdekt die celdifferentiatie controleren in lever en pancreas (alvleesklier). In parallel hebben wij gevonden dat dysfunctie van die genen gepaard gaat met ziektes zoals congenitale misvormingen, metabolische anomaliën en kanker. De lever in embryos bestaat essentieel uit hepatoblasten die zich progressief ontwikkelen in hepatocyten of cholangiocyten. Hepatocyten oefenen de metabolische functies van adult lever uit, en cholangiocyten omlijnen de galwegen. Wij hebben genen geïdentificeerd die bepalen hoe hepatoblasten zich ontwikkelen tot hepatocyten of cholangiocyten, en wij bestuderen nu hoe dysfunctie van die genen aanleiding kan geven tot pathologiën. Ten eerste werd er vastgesteld dat hepatocyten in leverkanker kunnen converteren tot kwaadaardige cholangiocyten, en wij determineren in hoeverre dit wordt beïnvloed door differentiatiegenen. Ten tweede, zijn er een aantal metabolische aandoening die in de toekomst door celtherapie zullen kunnen behandeld worden. In dit geval bestaat de celtherapie uit de administratie van in vitro-geproduceerde hepatocyten. Het laboratorium kollaboreert met andere onderzoeksteams om in vitro productie te optimizeren, en onze bijdraging hierbij ligt in het omzetten van onze know-how in celdifferentiatie. Wij hebben ook genen geïdentificeerd die pancreatische celontwikkeling controleren. Embryonale progenitorcellen in de pancreas geven aanleiding tot adult hormoon-producerende cellen, tot acinaire cellen die spijsverteringsenzymen produceren, en tot canalaire cellen die de pancreatische afvoergangen omlijnen. Zoals in lever kan pancreaskanker geïnitieerd worden door abnormale celdifferentiatie. Wij onderzoeken nu hoe dysfunctie van differentiatiegenen pancreaskanker veroorzaakt et welk pancreatisch celtype (acinair en/of canalair) aan de oorsprong ligt van de tumoren. Een beter begrip van kankerontwikkeling in pancreas en lever moet leiden tot vroeger diagnose en sneller en meer efficiente aanpak van de ziekte bij patiënten. In the embryo, liver progenitor cells (hepatoblasts) derive from the endoderm, the cell layer that delineates the primitive gut. The classical model of liver development predicts that hepatoblasts give rise to hepatocyte precursors, which mature to hepatocytes, and to "ductal plate cells", which generate the cholangiocytes and form bile ducts. Using trangenic mouse models, we have updated the fate map of the hepatic cells in the embryo: the ductal plate cells generate cholangiocytes and bile ducts, but also a subset of hepatocytes, as well as the adult liver stem cells. We now investigate the mechanisms that control acquisition and maintenance of liver cell differentiation in health and disease. During development, liver progenitor cells called hepatoblasts give rise to hepatocyte and cholangiocyte precursors. These cells then mature to generate adult hepatocytes forming cords and cholangiocytes delineating bile ducts. Part of the cholangiocyte precursors revert to a hepatocyte phenotype or give rise to adult liver progenitor cells. Our discovery of the Onecut transcription factors Onecut-1 (OC-1/HNF-6), OC-2 and OC-3, and the subsequent phenotypic characterization of HNF-6 and OC-2 knockout mice led to the identification of transcriptional and signaling networks regulating liver development. Current efforts are devoted to the characterization of the transcription factor–microRNA networks that control hepatocyte differentiation. Cholangiocytes delineate the lumen of the bile ducts and modify the composition of the bile. We investigate transcription factors and microRNAs that control cholangiocyte differentiation and bile duct morphogenesis. In this context, we found that biliary development proceeds according to a unique process characterized by transient asymmetry. In collaboration with clinical centers, we investigate how the knowledge gained from our fundamental studies can be translated in the understanding of the pathophysiology of human biliary diseases. The latter include polycystic liver disease and cholangiocarcinoma. Like the liver, the pancreas develops as an outgrowth of the endoderm. Pancreatic progenitors derived from the endoderm form two buds (dorsal and ventral) which later fuse to form a single organ. Within these buds the progenitor cells give rise, through a stepwise process, to endocrine, acinar and duct cells. 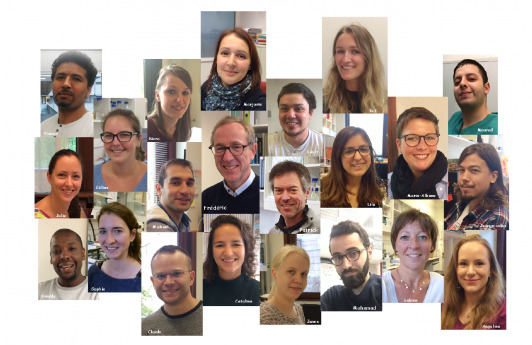 Our group investigates the molecular mechanisms that control development of the various pancreatic cell types, and the maintenance of the differentiated phenotype in adults. Our research on the role of the Onecut transcription factor OC-1/HNF-6 uncovered that this protein is required for development of endocrine cells and pancreatic ducts. In the absence of HNF6, endocrine cells fail to develop in the embryo and ducts form cysts. Subsequent research identified transcription-factor microRNA networks in pancreatic cell differentiation. Current work is focused on the role of gene regulatory networks, oncogenes and signaling pathways in development of pancreatic adenocarcinoma from acinar or ductal cells. Alcian Blue staining of section of a pancreas expressing the oncogene Kras (left) and of a pancreas expressing the oncogene Kras in the absence of the transcription factor Sox9 (right). Dark blue staining identifies preneoplastic lesions whereas no such lesions are seen in the absence of Sox9. This result reveals that Sox9 is essential for the initiation of pancreatic ductal adenocarcinoma. MicroRNA-337-3p controls hepatobiliary gene expression and transcriptional dynamics during hepatic cell differentiation. Demarez C, Gérard C, Cordi S, Poncy A, Achouri Y, Dauguet N, Rosa DA, Gunning PT, Manfroid I, Lemaigre FP. Chronic pancreatitis and lipomatosis are associated with defective function of ciliary genes in pancreatic ductal cells. Augereau C, Collet L, Vargiu P, Guerra C, Ortega S, Lemaigre FP, Jacquemin P.
Hum Mol Genet. 2016; 25(22):5017-5026. Transcription factors SOX4 and SOX9 cooperatively control development of bile ducts. Poncy A, Antoniou A, Cordi S, Pierreux CE, Jacquemin P, Lemaigre FP. Let-7b and miR-495 stimulate differentiation and prevent metaplasia of pancreatic acinar cells by repressing HNF6. Prévot PP, Augereau C, Simion A, Van den Steen G, Dauguet N, Lemaigre FP, Jacquemin P.
Prévot PP, Simion A, Grimont A, Colletti M, Khalaileh A, Van den Steen G, Sempoux C, Xu X, Roelants V, Hald J, Bertrand L, Heimberg H, Konieczny SF, Dor Y, Lemaigre FP, Jacquemin P.
A feedback loop between the liver-enriched transcription factor network and miR-122 controls hepatocyte differentiation. Laudadio I, Manfroid I, Achouri Y, Schmidt D, Wilson MD, Cordi S, Thorrez L, Knoops L, Jacquemin P, Schuit F, Pierreux CE, Odom DT, Peers B, Lemaigre FP. A classification of ductal plate malformations based on distinct pathogenic mechanisms of biliary dysmorphogenesis. Raynaud P, Tate J, Callens C, Cordi S, Vandersmissen P, Carpentier R, Sempoux C, Devuyst O, Pierreux CE, Courtoy P, Dahan K, Delbecque K, Lepreux S, Pontoglio M, Guay-Woodford LM, Lemaigre FP. Organogenesis and development of the liver. Si-Tayeb K, Lemaigre FP, Duncan SA. Intrahepatic bile ducts develop according to a new mode of tubulogenesis regulated by the transcription factor SOX9. Antoniou A, Raynaud P, Cordi S, Zong Y, Tronche F, Stanger BZ, Jacquemin P, Pierreux CE, Clotman F, Lemaigre FP. Control of liver cell fate decision by a gradient of TGF beta signaling modulated by Onecut transcription factors. Clotman F, Jacquemin P, Plumb-Rudewiez N, Pierreux CE, Van der Smissen P, Dietz HC, Courtoy PJ, Rousseau GG, Lemaigre FP. The onecut transcription factor HNF6 is required for normal development of the biliary tract. Clotman F, Lannoy VJ, Reber M, Cereghini S, Cassiman D, Jacquemin P, Roskams T, Rousseau GG, Lemaigre FP. Transcription factor hepatocyte nuclear factor 6 regulates pancreatic endocrine cell differentiation and controls expression of the proendocrine gene ngn3. Jacquemin P, Durviaux SM, Jensen J, Godfraind C, Gradwohl G, Guillemot F, Madsen OD, Carmeliet P, Dewerchin M, Collen D, Rousseau GG, Lemaigre FP. Mol Cell Biol. 2000; 20(12):4445-54. Hepatocyte nuclear factor 6, a transcription factor that contains a novel type of homeodomain and a single cut domain. Lemaigre FP, Durviaux SM, Truong O, Lannoy VJ, Hsuan JJ, Rousseau GG. Proc Natl Acad Sci USA. 1996; 93(18):9460-4.